God is the creator of everything. He breathed life into animals and man, and made them living souls. We can see a manifestation of the love of God reflected in a mother caring for her new born child and tending to its every need. Likewise, as a mother bear protects her cub from danger, God is always watching over us, protecting us from evil. “The Lord is good to everyone. He showers compassion on all His creation” (Psalm 145:9). God created man and animals according to His infinite love and wisdom. “O Lord, how many are Your works! You made them all in wisdom. The earth is full of what You have made. There is the wide sea full of both large and small animals. There are too many for us to number” (Psalm 104:24-25 NLV). God values everything He created, including animals, and He wants only the best for them. In this paper I will discuss God’s love for animals. In the beginning God created the heavens and the earth, and He was pleased with all He made. But He wanted more. He wanted relationship and fellowship. His desire to pour out, and receive love in return remained unfulfilled. So He decided to create animals and man. Let the waters be full of living things. Let birds fly above the earth in the open space of the heavens. God made the big animals that live in the sea, and every living thing that moves through the waters by its kind, and every winged bird after its kind. And God saw that it was good. God wanted good to come to them, saying, “Give birth to many. Grow in number. Fill the waters in the seas. Let birds grow in number on the earth”… Then God said, “Let the earth bring into being living things after their kind: Cattle and things that move upon the ground, and wild animals of the earth after their kind.” And it was so. Then God made the wild animals of the earth after their kind, and the cattle after their kind, and every thing that moves upon the ground after its kind. And God saw that it was good (Genesis 1:20-22, 24-25 NLV). God was pleased with His animal creation. I believe God derived tremendous joy from watching mice scurrying in the grass, dolphins playing in the water, monkeys swinging through the trees and dogs chasing their tails! God delighted in seeing His creation enjoying the life that He gave them. He wanted only good to come to His animals. Then God said, “Let Us make man like Us and let him be head over the fish of the sea, and over the birds of the air, and over the cattle, and over all the earth, and over every thing that moves on the ground.” And God made man in His own likeness. In the likeness of God He made him. He made both male and female. And God wanted good to come to them, saying, “Give birth to many. Grow in number. Fill the earth and rule over it. Rule over the fish of the sea, over the birds of the sky, and over every living thing that moves on the earth” (Genesis 1:26-28 NLV). God named the man Adam. God brought every one of His animals to Adam to see what he would call them. He declared His ownership over animals when He said: “For every animal among the trees is Mine, and the cattle on a thousand hills” (Psalm 50:10-11 NLV). He then entrusted them into Adam’s care, and He commanded both man and animals to be fruitful and multiply. Now at this time there was no death, pain or violence; there was only life, joy, peace and blessings. God provided man and animals a perfect environment within which to live, where all their needs were met. God’s plan was to pour out His goodness on them forever. But something went wrong. For God had issued a command to Adam when He said, “…You may freely eat of every tree of the garden; But of the tree of the knowledge of good and evil and blessing and calamity you shall not eat, for in the day that you eat of it you shall surely die” (Genesis 2:16-17 AMP). Adam disobeyed God’s command and as a result, the entire creation fell and became subjected to death and destruction. After Adam sinned, God made a decision. He would later send Jesus Christ to redeem creation from the curse of sin and death. However, in the meantime, He made a covenant with man and animals. Then God told Noah and his sons, “I am making a covenant with you and your descendants, and with the animals you brought with you — all these birds and livestock and wild animals. I solemnly promise never to send another flood to kill all living creatures and destroy the earth.” And God said, “I am giving you a sign as evidence of my eternal covenant with you and all living creatures” (Genesis 9:8-12). However, this fact does not justify man assuming an attitude of superiority or indifference toward animals. God placed intrinsic value in them, and we should respect them as part of God’s creation, thereby honoring God. Then I realized that God allows people to continue in their sinful ways so He can test them. That way, they can see for themselves that they are no better than animals. For humans and animals both breathe the same air, and both die. So people have no real advantage over the animals. How meaningless! Both go to the same place — the dust from which they came and to which they must return. For who can prove that the human spirit goes upward and the spirit of animals goes downward into the earth? (Ecclesiastes 3:18-21). I believe in my heart that faith in Jesus Christ can and will lead us beyond an exclusive concern for the well-being of other human beings to the broader concern for the well-being of the birds in our backyards, the fish in our rivers, and every living creature on the face of the earth (Wesley). 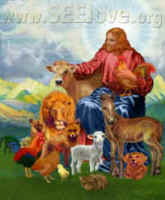 As I have stated earlier, God owns every animal and has entrusted man with a stewardship over them. Our example is Jesus, who came as a servant and humbled Himself before sinful and wicked men. He came to serve, not to be served, even though He was God. He would pay the price for man’s sin by dying on the cross. In return, God expects man to follow Jesus’ example. His Word says: “No, O people, the LORD has already told you what is good, and this is what He requires: to do what is right, to love mercy, and to walk humbly with your God” (Micah 6:8). Therefore, man’s attitude toward animals must be one of loving-kindness and compassion. Jesus was the perfect reflection of God, and the manifestation of God’s love and mercy toward His creation. We are to be “imitators of Christ.” Jesus called Himself the Good Shepherd. A shepherd’s duty is to care for his flock and protect them. Son of man, prophesy against the shepherds, the leaders of Israel. Give them this message from the Sovereign Lord: “What sorrow awaits you shepherds who feed yourselves instead of your flocks. Shouldn’t shepherds feed their sheep? You drink the milk, wear the wool, and butcher the best animals, but you let your flocks starve. You have not taken care of the weak. You have not tended the sick or bound up the injured. You have not gone looking for those who have wandered away and are lost. Instead, you have ruled them with harshness and cruelty” (Ezekiel 34:2-4 2). Jesus came to seek and save the lost, and commanded us to help the oppressed and weak. As this passage indicates, God refers to the sheep as weak, and Jesus rebuked the shepherds for their cruel treatment of their flocks. Another example of God’s displeasure at cruelty to animals is found in Proverbs 12:10: “The godly are concerned for the welfare of their animals, but even the kindness of the wicked is cruel.” God calls cruelty to animals wicked. Finally, God rebuked Balaam for beating his donkey, when that donkey was trying to save his life. “Why did you beat your donkey those three times?” the angel of the Lord demanded. “Look, I have come to block your way because you are stubbornly resisting me. Three times the donkey saw me and shied away; otherwise, I would certainly have killed you by now and spared the donkey” (Exodus 22:32-33). Balaam was about to be killed by the Lord, and God was using that donkey to try and save his life. This is a great testimony to how God values animals, and will even use them to try and save man from His judgment. There are many more scriptures that address the subject of man’s treatment of animals and regarding man’s stewardship over animals. The Bible’s emphasis is on the good treatment of animals, and not just the forbidding of cruel treatment (Graham). Every day thousands of animals are systematically and mercilessly abused, tortured and exploited. Animals that have no means of defending themselves are being victimized by the ones that God called to care for them. Animals are God’s creatures, not human property, nor utilities, nor resources, nor commodities, but precious beings in God’s sight....Christians whose eyes are fixed on the awfulness of crucifixion are in a special position to understand the awfulness of innocent suffering. The Cross of Christ is God’s absolute identification with the weak, the powerless, and the vulnerable, but most of all with unprotected, undefended, innocent suffering (Linzey, All Creation Liberation). The current plight of animals is heart-breaking to me. Instead of being respected and protected by man, animals are being subjected to cruelty, suffering and oppression. And their suffering is rapidly increasing and is being largely ignored. What should move our very hearts and sicken us,… is the realization that animals are morally innocent, that they have done no harm. Next they have no power whatever of resisting; it is the cowardice and tyranny of which they are victims which makes their suffering so especially touching... there is something so very dreadful, something so dreadful, so satanic, in tormenting those who have never harmed us and who cannot defend themselves, who are utterly in our power …” (Linzey, Animal Gospel 65). Why should man care about the suffering of animals? If the aforementioned reasons are not reason enough, then here is another fact. Animals are sentient beings. The word sentient, in the Webster’s dictionary, means “sensitive in perception and feeling.” Animals feel the same physical and emotional pain as do humans. They possess a soul, which is the seat of the mind, will, and emotions. Pain is pain, whether it is inflicted on man or on beast; and the creature that suffers it, whether man or beast, being sensible of the misery of it whilst it lasts, suffers evil…. (Primatt). For example, if I pull a plant out of the ground, it does not cry out in pain. However, if I kick a dog, it will yelp in pain and run away. If I throw beans into a pot of boiling water, those beans do not try to jump out of the pot. However, if I throw a live lobster into that pot of boiling water, that animal immediately screams out in excruciating pain. It does everything it possibly can to escape from that pain and torment, even while it is being shoved back into the water against its will. To be sure, if someone threw me into a pot of boiling water, I would feel the same agony as that lobster and I would do the exact same thing. I would never want someone to do this to me, therefore, the thought of me doing this to one of God’s beloved creatures is unthinkable. Such an act is totally unacceptable to God, who is loving, kind and merciful. Yet this act of pure cruelty and violence is habitually committed against lobsters, and this is just one example of the many, many acts of cruelty that are routinely perpetrated against God’s animals. True benevolence, or compassion, extends itself through the whole of existence and sympathizes with the distress of every creature capable of sensation (Addison). Living creatures possess a moving soul...they flee from pain and death (Nachmanides). Animals have a right to live, thrive and be protected. Only God has the right to take their life from them, because He is the one who breathed His life into them. God’s creatures have a derived right to live a natural life and to be loved, cared for, and protected against abuse and exploitation. Said another way, since God values and cares for all creation, creation has a derived right to be valued and cared for by humans for God’s glory (Young 37). God created animals and meant no evil or harm to be done to them. However, Adam brought all creation under a curse because of his sin. Jesus demonstrated the nature of a loving, kind and merciful Father when He came to earth and He humbled Himself before sinful and wicked men, laying down His life to die on the cross. Jesus’ death redeemed creation from the curse of sin and death. Jesus was our example of the grace and mercy that God expects us to extend to one another and to the animals He created in His love and wisdom. If we love God, it is right to consider our attitudes toward animals and our treatment of them. It is my hope that the reader of this paper will be enlightened to a new level of understanding with regard to the importance of animals in the sight of God. Linzey, Andrew. Animal Gospel. Louisville, Kentucky: Westminster John Knox Press, 2000. Young, Richard Alan. Is God A Vegetarian? Carus Publishing Company, 1999. Unless otherwise indicated, all scriptural quotations are from the New Living Translation of the Bible. GGo on to: GOD’S PEOPLE OR GOD’S REJECTS?